How are fish fry fed? The organism of newly born fish is concerned with one thing only, to grow, grow and grow again. Therefore young fish need a feed whose ingredients are selected to meet the needs of a rapidly growing organism. During the first few weeks of life the young fish should almost never be without food. It is important that young fish be fed at least 4 5 times a day, as poorly-nourished young fish can never make up the lack of growth during those first few weeks. Successful breeding can be proof of correct feeding and care. It is the high spot of fish keeping. As a rule, a hobby breeder has his first experience of providing feed for young fry with the off spring of guppies or other live bearing species. Usually this initial experience has to be gained in a general community tank, a special breeding or nursery tank is not often purchased until a later date, if at all. We recommend the use of the JBL BabyHome, a spawning box which protects the offspring from harassment from adult fish during the first weeks of life. The rearing feed set, JBL NovoBaby, consists of a complete set of three feed sorts with graduated grain size, NovoBaby 01, NovoBaby 02 and NovoBaby 03. This set provides all the nutrients needed to rear the first offspring, from new born fry to healthy adult guppy. is a powdered feed, developed to include the ideal ingredients and particle size for the rearing of young fish of livebearing species. The young fish of egg-laying species may also be fed with JBL NovoTom when they have reached the size of, for example, a new born guppy. The particularly high proportion of high quality protein and minerals ensures the healthy growth of young fish. 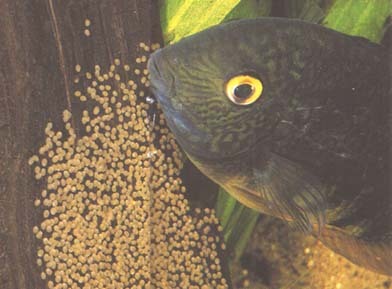 An excellent live feed for rearing young fish, which is free from disease carrying bacteria, may be hatched from these eggs whenever required. The eggs are bred in vigorously aerated salt water and the hatched nauplii of the little saline crabs are fed to the young fish. One or more clear 3/4l bottles, a membrane pump, air hose, one or more culture apparatuses and an artemia sieve (pet shop) are needed to hatch the eggs. Follow the procedure described in the operating instructions of the culture apparatus. The nauplii hatch within 24 48 hours at a temperature of 24 28?C (the higher the temperature, the quicker the hatching). When feeding, be careful not to include any empty egg cases or unhatched eggs. These may obstruct the intestines of young fish and cause death. The newly hatched larva are an ideal feed for small fish and smaller breed. As a rule, a hobby breeder has an ultra fine, homogenised liquid feed, especially rich in vitamins, was specifically developed to meet the needs of the tiny young fish of egg laying breeds (e.g. characine, barbels). 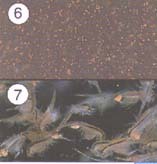 The liquid form in a drop bottle enables optimal dosage according to the number of young fish. High quality nutrients and the special vital vitamins ensure that the tiny young fish, swimming freely for the first time, quickly grow strong.